Video files which do not conform to these requirements (to the codec, container or frame size) would need to be transcoded (modified) prior to being uploaded to izi.TRAVEL CMS. There are a number of programs for converting video from one format into another. 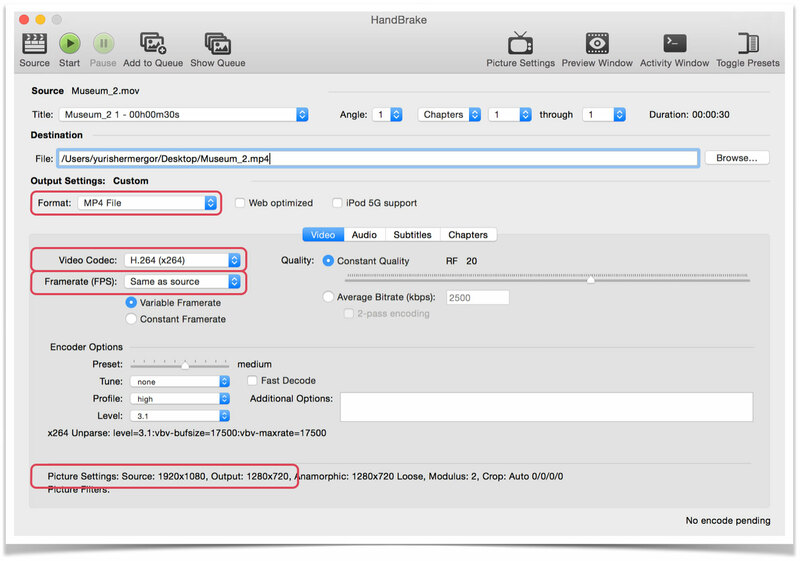 In this document, we will discuss the simplest actions involved in video transcoding with the free app HandBrake. Source – button for loading the original video. Start – button for starting the coding process. 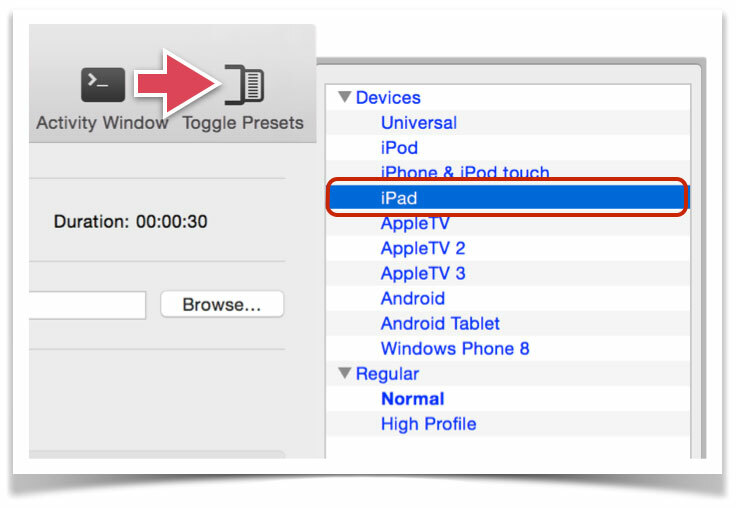 Toggle Presets – call up the list of coding settings presets. File – file path and name of the original file. Browse –button for calling up the standard dialog specifying the file path and name of the final video file. Format – list of the available video coding formats. 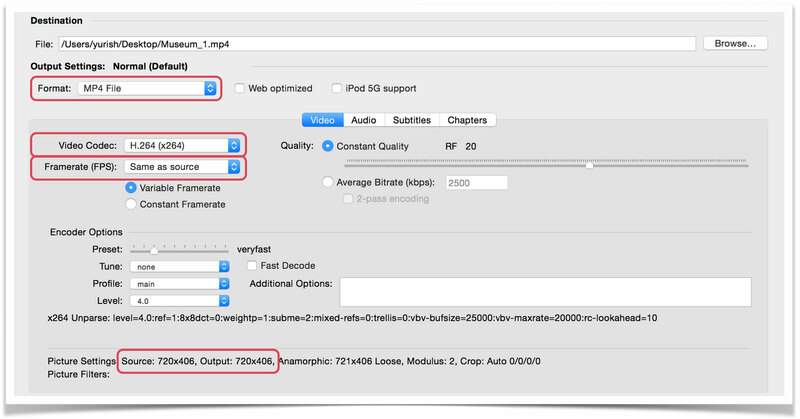 Video Codec – list of available codecs. 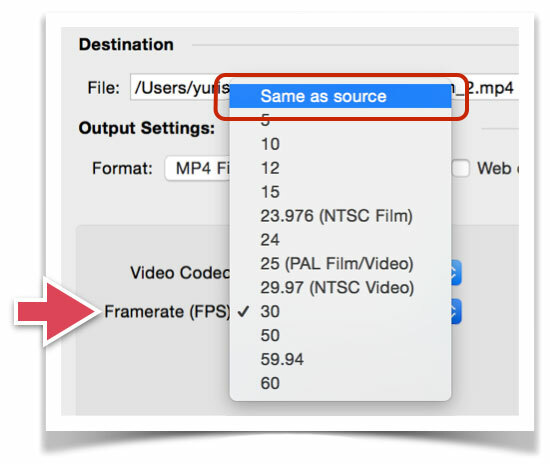 Framerate (FPS) – setting the frame frequency of the original video. 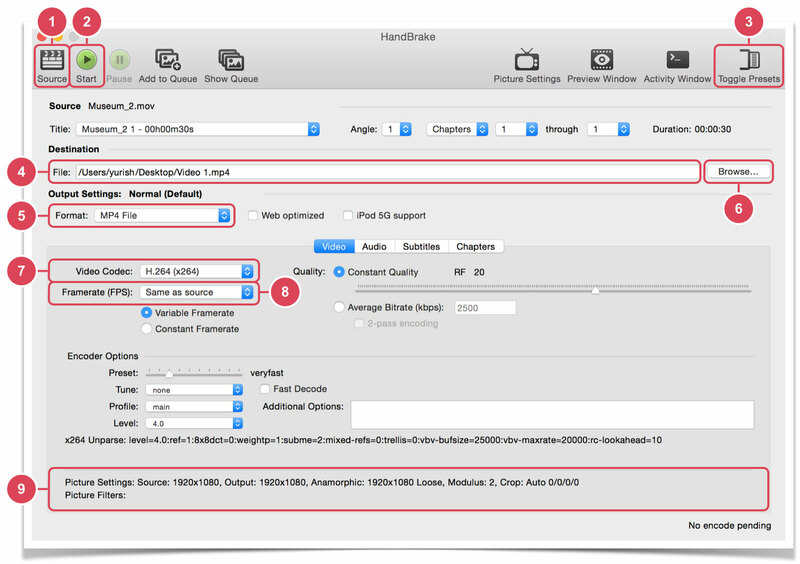 Picture Settings – status line of the input and output video parameters. izi.TRAVEL CMS supports H.264 / MPEG-4 AVC video with a resolution up to 1280×720. Therefore, when setting the video coding parameters, it is necessary to conform to these values. Step 1. Tap the Source button 1 and select the video file to be converted from the opened standard dialog. Step 2. Tap the Browse button 6 and specify the converted video’s name and save location. The frame size should not exceed 720 pixels on the short side (720 p). If the frame size does not exceed 720 pixels on the short side, the size does not need to be changed; just conversion will be sufficient. If, however, the frame size exceeds 720 pixels on the short side, the conversion would need to be accompanied by resizing. Step 1. Tap the Toggle Presets button. Step 2. From the list, select the Normal preset. Framerate (FPS): Same as source. Picture Settings: Source and Output parameters are identical. Step 3: Tap the Start button. Video conversion starts. During this process, information about the performed operations and progress bar will be displayed in the lower part of the window. The final video file will be placed according to the file path indicated in the File entry. Check its size. It should not exceed 50 MB. If the file size exceeds 50 MB, it cannot be used in the mobile audio guides. In such a case, you would need to either shorten the video duration by deleting certain fragments or reduce the video frame size. Step 2. From the list, select either the “iPad” preset or another one with a suitable frame resolution (no larger than 720 p). The frame dimensions determined by the selected preset are shown in the lower part of the app screen. Picture Settings: the Output parameter has a value less than or equal to 720 p.
Step 4. To start converting, tap the Start button. The final video file will be placed according to the file path indicated in the File entry. Check the size of the final video file. It should not exceed 50 MB. If the file size exceeds 50 MB, it cannot be used in the mobile audio guides. In such a case, you would need to either shorten the video duration by deleting certain fragments or reduce the video frame size.